I don't know if I've ever met another person that doesn't enjoy a good pampering. Even the most hardened of people will admit to enjoying a little indulgence here and there! 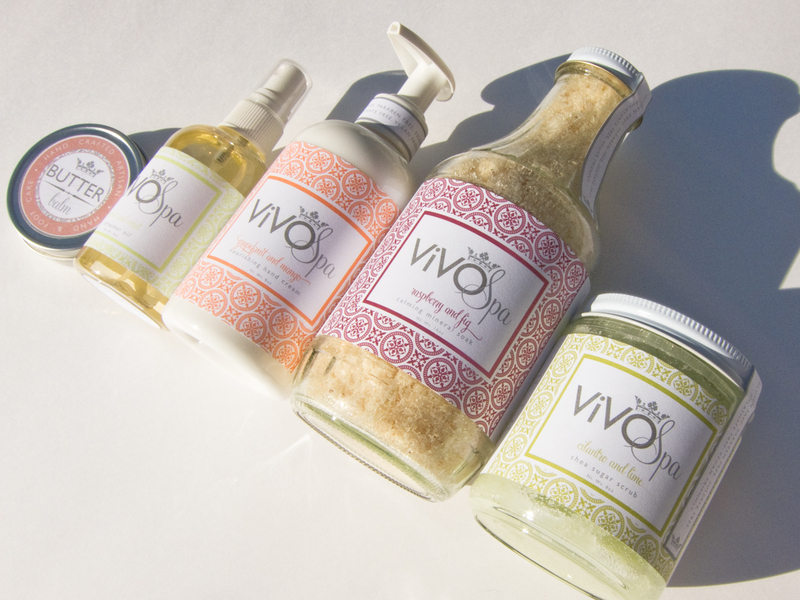 ViVO Spa Boutique products help to bring the spa feeling to your home without the use of parabens, SLS, or phthalates. As if that wasn't enough, they're also eco-friendly, gluten free, vegan, and developed by a manicurist! 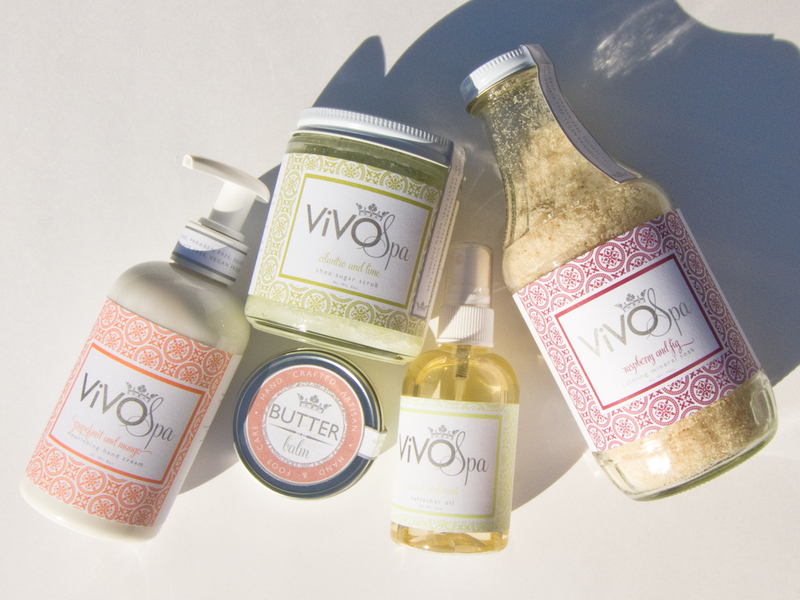 Read on for my first impressions of five of Vivo Spa's products, and enter for your chance to win them all for yourself! Nourishing Hand Cream in Grapefruit and Mango - This hand cream is really nice, maybe my favorite product of the bunch! It's slightly thicker than a lotion but isn't too thick like many hand creams can be. It absorbs nicely and isn't overly greasy. The grapefruit and mango scent is delectable; the mango smells sweet while the grapefruit adds the sharpness of sour citrus to balance it out. Butter Balm in Almond and Vanilla - This balm is made with coconut oil and shea butter. It is first intended as an intensive care product for dry, cracked feet, but it also works on any areas of your body that may need a little extra lovin'. Just be careful - the coconut oil can get slightly melty in the heat. Try storing it in the fridge and rubbing the tin directly on your heels or elbows for a cooling spa treatment! The almond and vanilla scent is very mellow. It's not sweet like the scent of marzipan, it's more on the musky side. Shea Sugar Scrub in Cilantro and Lime - Ok - first things first. I am a mega cilantro hater and I was totally worried about not liking this particular scent. 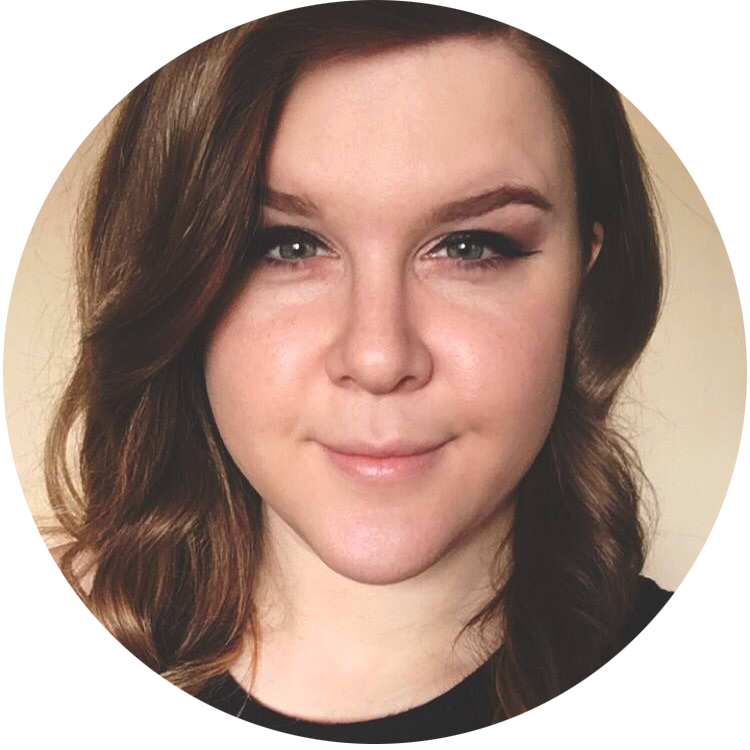 I was really pleasantly surprised! The brightness of the lime is most prominent, but the cilantro rounds it out with a bit of freshness. I used this scrub on my hands (I frequently scrub my hands to keep them looking their best) and they felt nicely exfoliated and smooth afterwards. Extra bonus: the scrub also has moisturizing ingredients so after you rinse off the scrub, you're already hydrated. Refresher Oil in Coconut and Mint - This is one of the more unique products in the mix. This oil is packaged in a spray bottle for quick, on-the-go moisturizing. It's formulated with coconut, apricot, and sweet almond oils, and sprays on in a fine mist. I've never used oil for moisturizing, so I was apprehensive, but this product felt good on my skin. The coconut and mint scent is unique, faintly tropical and decidedly herbal. Calming Mineral Soak in Raspberry and Fig - I can't honestly say that I use soaks, but this one smells so good that I just might have to start. This sea salt soak can be used in the bath or as a pedi soak. The scent is well balanced between sweet raspberry and rich fig. It's one of the more luxurious scents in the lineup. The packaging on ViVO products is gorgeous, which I really appreciate. They are definitely worthy of displaying on your vanity! All of the scents that I sampled were very refined and balanced, and I could see any of them fitting in very easily at an expensive spa. Each sniff made me feel more relaxed, and that's the honest truth. Want to try ViVO products for yourself? Enter to win all of these products via the Rafflecopter giveaway below, or use the code CHALKBOARDNAILS25 to get 25% off your order in the ViVO shop. Must be a follower of Chalkboard Nails to win. Must be 18 years of age or older, or you must have your parent's permission to enter. Giveaway closes on 6/4/14 and is open to US residents only. Prize is provided and shipped by ViVO Spa Boutique. The winner will have 48 hours to claim their prize, after which a new winner will be chosen as necessary. DISCLOSURE: This giveaway is sponsored by ViVO Spa. All opinions are my own. Vanilla almond scents are my favvvorite. Very intrigued by this whole line. This sounds so wonderful! Thanks for the yummy giveaway! Vivo Spa looks so great, I'm definitely interested in all the Coconut products, I LOVE coconut!!! Great giveaway! I want the Cilantro Lime Shea Butter Scrub! The raspberry fig hand cream! Looks like a great set. Best of luck to everyone who can enter the giveaway. The butter balm sounds fantastic! The sea salt soaks sound amazing! Thanks for a great giveaway! I love me a good scrub so that's what I'd be most excited to try. I definitely want to try one of the hand creams. The grapefruit mango one sounds like it smells wonderful! And it comes in a travel size too! The Raspberry and Fig Bath Salts looks amazeballs! Loving the mineral soak! Raspberry is always amazing. Great giveaway! I am most interested in the Raspberry Fig bath soak! Sounds like it smells amazing! The cilantro and lime sugar scrub! Coconut mint shea foot cream!!! I love the cilantro lime shea sugar scrub!! The bath salt soaks, definitely! I am more excited about the sugar scrub! The flavors sound divine....Grapefruit Mango Bath Salt Soak- Foot Soak....yum! I would love to try all of the sugar scrubs! They look amazing! I want to try, Freesia & Pear Shea Foot Cream. I really want to try the foot butter. I think the freesia and pear foot butter would be amazing! The coconut mint shea foot cream looks yummy! Raspberry Fig Hand Cream sounds wonderful!